In Pittsburgh, PA, it is traditional to buy Isaly’s Chipped Chopped Ham and add your favorite barbecue sauce to it. While you can just go to the store and use BBQ sauce right off the shelf, it’s much better if you make my family’s Signature Homemade BBQ Sauce. I made it for the Super Bowl. Although the Steelers didn’t win the Super Bowl, but our Ham barbecue sandwiches were a true winner! This sauce is finger licking good! 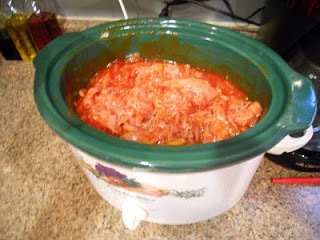 Add all ingredients to a crock pot and simmer for 30 full minutes. I had to adjust the recipe because I only had 2 lbs of chipped chopped ham. My recommendation is to cut all the ingredients in half except for the onion and celery. You can add as much or little onion and celery for your liking. I started off with a 1/2 a cup of water, but added water as needed based on if you want a thicker sauce or not. Remember that the meat will soak the sauce up, so be prepared to make another batch if needed. Its suppose to be a big sloppy mess while eating!